AMSTERDAM, NETHERLANDS – August 6, 2018 – Gartner just issued its “Hype Cycle for ICT in India, 2018”. StackState, the market-leading Next-Gen Monitoring and AIOps platform, is proud to be named as a key vendor in the Artificial Intelligence for IT Operations (AIOps) Platforms category. 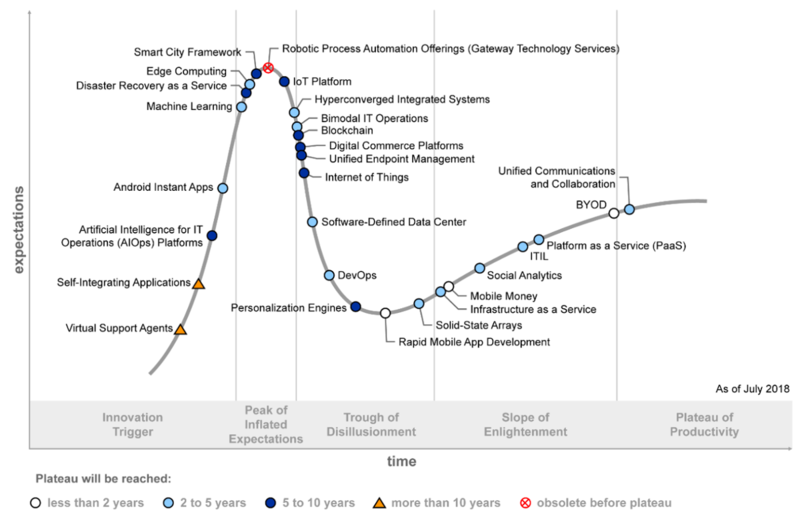 Hype Cycles are great to understand what emerging technologies are showing the signs of fast movement. This Hype Cycle is an update of the "Hype Cycle for ICT in India, 2017" and is meant to enable senior IT leaders to assess and adopt upcoming technologies, and to optimize existing processes and investments. StackState is focussed on delivering to the needs of monitoring today’s complex enterprise scale IT environments. By providing a unique Next-Gen Monitoring and AIOps solution, StackState succeeded in driving massive market traction and rapid customer adoption since its launch in 2015. AIOps platforms represent the evolving and expanded use of technologies previously categorized as IT operations analytics (ITOA). With AIOps platforms, enterprises will be able to consolidate their data and tools in one place and make sense of it instantaneously. AIOps platform provides full stack visibility and the ability to understand how the business, applications and all underlying infrastructure are related to each other. This real-time visibility will make IT Operations teams smarter, faster and more efficient. StackState is founded in 2015 as a spin off from Xebia. StackState is part of Xebia Group with 700+ people worldwide. The original article from StackState can be found here.